Last week, Stanbridge College students and staff volunteered at the First Annual Orange County Stand Down for homeless and low-income veterans. The event was hosted by Veterans Firsts OC. 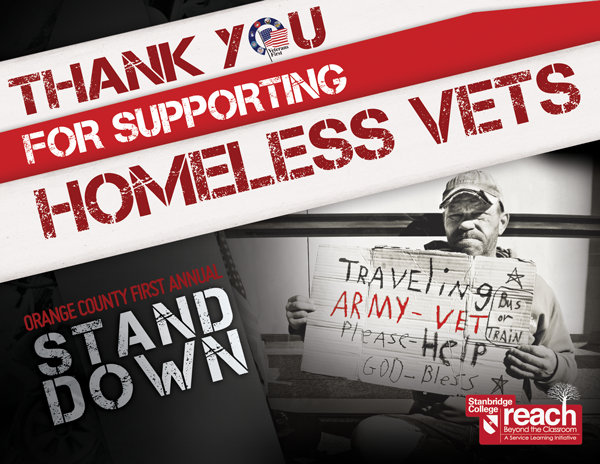 The OC Stand Down provided veterans in need with essential services such as medical, dental, and vision exams, employment and housing assistance, as well as Veterans benefit management and identification. Stanbridge College staff and students volunteered in administrative tasks, served food, and assisted with tent assignments. Stanbridge College’s commitments to long-term community partnerships, creating a positive impact on local and global communities and incorporating Civic Engagement and Service Learning as an integral part of the curriculum are exemplified in its REACH – Beyond the Classroom initiative. The REACH initiative provides students with opportunities to give back to the community while earning credit towards coursework in a structured environment. To learn more about Stanbridge College’s REACH – Beyond the Classroom, visit the Stanbridge College REACH program. Learn more about Veterans First OC at http://www.veteransfirstoc.org. To learn about the 1st Annual OC Stand Down visit: http://ocstanddown.org/.